I honestly can't ever get enough of Founding Farmers. I visited last February and July 4th weekend. It's a staple! My friend Ashley was even berating me on Friday night when she found out our Saturday brunch plan was at Founding Farmers. She insists I need to try other brunch spots like Masa 14, a Latin American fusion restaurant that serves unlimited brunch with drinks for $35, or Lincoln, a relatively new restaurant with seasonal small plates. 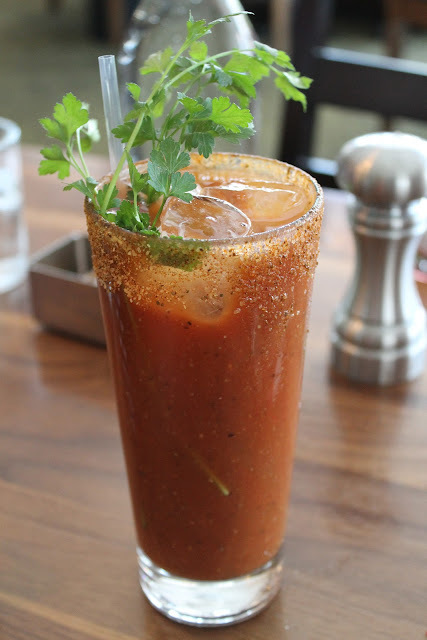 But no, we had to go back to Founding Farmers, and it left a terrific impression as usual, with its freshly prepared "quality and natural ingredients". Red Velvet Pancakes, $8: Superb! These pancakes were dense and quite moist. We were going to share beignets, but changed our order as soon as we spotted this on the menu. 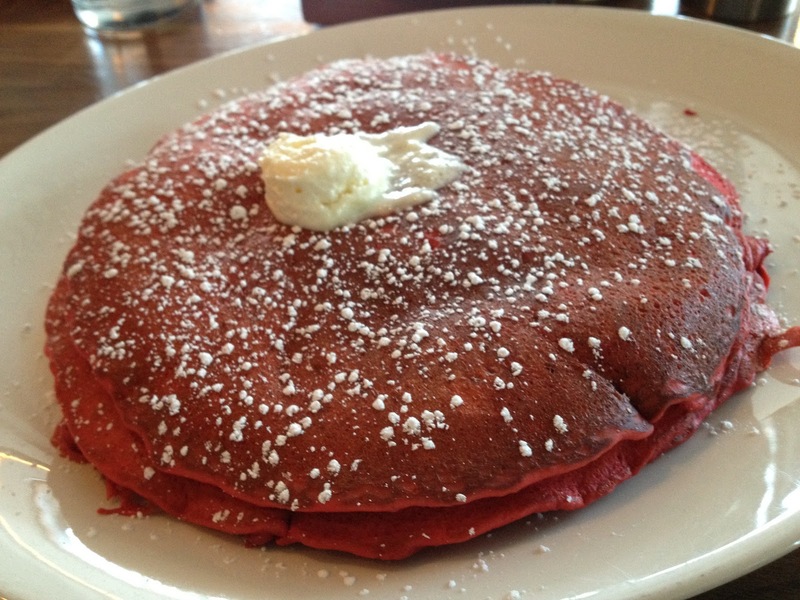 Red velvet pancakes are not as common as they should be at restaurants! Bloody Mary, $12: Natalie's brunch cocktail of choice. She said this was a little too spicy. We weren't very creative, and all ordered similar dishes, but they were all superb. Crab Benedict, $14: The egg benedicts are served with a choice of shredded leek hashbrowns, grits, Farmers salad, fruit or tomatoes. I went with the salad which was just as amazing as I remembered. There was avocado, pieces of fig, croutons, and champagne vinaigrette. The benedict was amazing, with plenty of crab under each poached egg. Crab Benedict, $12: Same as the one above, but with shredded leek hashbrowns on the side instead. "Red Flannel Hash", $12: goat cheese, pan roasted red beets, shredded leek hashbrowns, poached eggs. The beets were slightly sweet with an almost charred texture. So good. The best server ever. She was on it with checking on us at all the right times, and complimented my camera strap! Dyson airblade hand dryer in the bathrooms. Love them. Lovely smelling Mrs. Meyers Clean Day soy candle in lemon verbena burning in the bathroom.